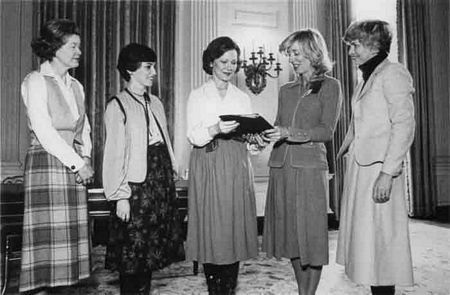 The Congressional Wives for Soviet Jewry Committee, of the National Conference on Soviet Jewry (NCSJ), presented Feb. 8th to Rosalynn Carter a bound volume of appeals compiled by the Moscow Women's Group. The Congressional Wives Committee received Mrs. Carter's assurance that the Administration would continue to support human rights for Jews in the Soviet Union and free emigration for those who wish to leave. Held in the East Room, the meeting drew 32 Congressional Wives and five officers of the NCSJ. Also addressing the gathering were Marshall Shulman, special advisor on Soviet affairs to Sec. of State Vance, and Jessica Tuchman Matthews, a global advisor to National Security Advisor Zbigniew Brzezinski. From the left are: Mrs. Henry Jackson, Mrs. James Blanchard, Mrs. Carter, Mrs. Harrison Williams and Mrs. Jack Kemp.